Elsa Pataky fired back at media reporting her marriage to Chris Hemsworth was under strain. After photos of the two "having a tense exchange" in Byron were published recently, and amid constant headlines questioning the couple's relationship, Pataky shared some thoughts on Instagram. 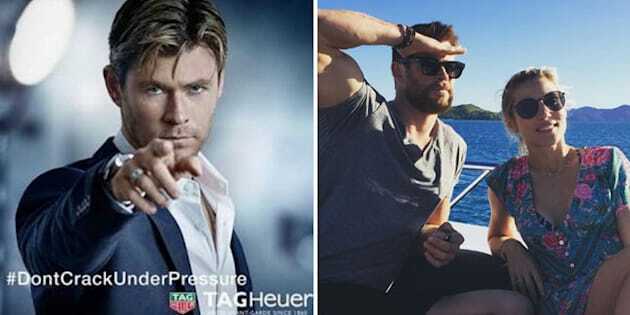 "I would be mad too if some magazines keep trying to keep us apart," she captioned a Tag Heuer ad of her hubby, repeating the tagline as the hashtag #dontcrackunderpressure. Repeating the caption in her native Spanish, Pataky also said "apparently you can not be surrounded by any woman or even your agent". This isn't the first time the couple have responded to speculation about their marriage, in October last year Chris posted a tongue-in-cheek Instagram taking a dig at "Women's Day". While the Thor star hasn't made any posts recently, it's clear these two are still very much in love. Click below to subscribe to the Refresh podcast by HuffPost Australia on iTunes.